Winslow United had to be content with a share of the spoils on Saturday after conceding a 94th minute equaliser to draw 2-2 with Hatfield Town in SSML Division One. It was an action-packed encounter with four goals, a red card and chances aplenty keeping both sets of fans entertained on a bitterly cold day. The game was a slow burner though, as Winslow shaded a tight first half with Gabriel Fayiah heading past the post for the visitors while Hatfield’s Emmanuel Banahene twice lashed off target. Ryan Pearman then produced a marvellous save to prevent Jason Castello from giving Winslow the lead, however the Hatfield goalkeeper could do nothing about Mark Wiltshire’s header from Lolu Onabolu’s cross finding the corner to put United 1-0 in front at half-time. Winslow then looked to have taken control when Grant Karwacinski was on hand to turn home the rebound after Castello hit the post in the second half, however Bruce Tahon stuck away a penalty within 90 seconds as Winslow were penalised for handball. In a game littered with cards, it came as no surprise when, on 80 minutes, a player saw red as Hatfield’s Ryan North was dismissed for a strong challenge. 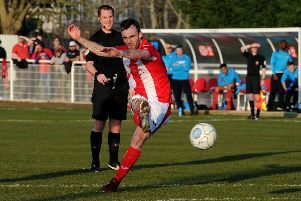 That should have been enough for Winslow to see out the victory but Hateley Mercer put a free-kick over and deep into stoppage time, Town captain Richard Cook found the bottom corner to spark wild celebrations and cruelly deny Winslow victory. Winslow remain 15th in SSML Division One and host Harpenden Town this weekend.